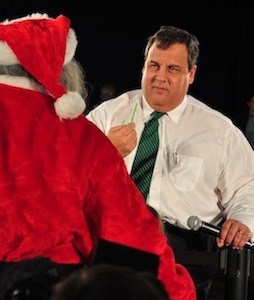 Gosh, you know, I hate to sound ungenerous, but is anyone else put off by the sight of New Jersey Gov. Chris Christie stomping up and down, pounding the floor and demanding, Where’s my $60 billion? Now listen. The New York City and New Jersey area – that’s my hometown. I have relatives there who were severely affected by Hurricane Sandy. People have suffered tragedies from which they will never really recover. I want the area to get help as much as anyone. Please put $60 billion under the tree, douchebag. But requests for other’s people’s money – and lots of it – should be made with some sense of humility. Assuming an adult population in the United States of about 250 million, $60 billion means every man and woman in the nation will be spending $240 to help out New Jersey and the rest of the region that was devastated by the hurricane. And that doesn’t include interest, since the government is out of money and we’ll have to pay the going rate in Beijing to borrow this. But in the Gimme Culture that President Obama is nurturing with his vast new federal programs and outlays, people – even Republican people – think less and less like this. They just assume money is coming from somewhere to help them out, whether that means digging them out from a natural catastrophe, helping them go to college, or granting them years worth of unemployment benefits. Is it really so callous to ask if New Jersey has a rainy day fund and, if not, why not? What’s more, Dan Henninger writes in today’s Wall Street Journal that FEMA’s effort to assist New Jersey is actually funded until spring. The money which the House has not yet approved – but surely will – is to get New Jersey through the rest of 2013 and beyond. Christie says hurricane relief should be beyond politics. But as he savages the unpopular House Republicans and Speaker John Boehner as shameful misanthropes who are “to blame for the continued suffering of these innocent victims,” it’s worth asking: who exactly is playing politics – the House GOP or the Republican governor running for reelection in a Bright Blue state? Christie already has raised $2 million for his gubernatorial campaign. How about, if we’re setting politics aside, we start with that money as a down payment on the funding to come? And after getting reelected, everyone knows where Christie thinks he’s headed. If the Gimme Culture one day actually pervades a Republican White House, then you’ll know it’s here to stay. I’m happy to see someone is calling him out. What HAS happened to Republicans? They took off their masks. Great comments Keith. I thought Christie had a bright future beyond NJ, but after all of his posturing over the last 60 days, I would not support the guy. If anyone knows about lard, it’s Christie. He’s out of the closet now – he needs to change his registration and officially join the Party of Corruption. On the other hand, if he does run on the Republican ticket, he will never get the nomination. He has himself over a barrel – a big, fat pork barrel. Christie will soon join the ranks of Charlie Crist. They’ll form a new company called Cristco. Unlike Costco, they won’t be selling in bulk but demanding that their paws get greased while riding the gravy train. Too many cabooses on the gravy train. So Mr Christie how’s that Obama bromance working out for you? Great article, Keith. I see Christie as a Quisling who paved the way for four more years with Barry and his gang. The Sandy bill should provide Congress the impetus to bring out the fine tooth comb–finally. Anything with nothing to do with Sandy should be removed from the bill, and we can no longer afford to provide people who choose to live in the path of recurring flooding expensive government bailouts. I’m thinking of the banks of the Mississippi as well as the coasts. I like your expression of where Christie thinks HE is going because the rest of us don’t share share that view. Will the Republican Party jettison the South to go for New Jersey? I think not. I feel sympathy for my countrymen who find themselves at the mercy of Mother Nature, but I resent having to pay for their folly of choosing to live where hurricanes, floods, tornados, earthquakes and other natural upheavals are common. Instead of handing GovChristie a check for billions of borrowed money, we should send the people of NewJersey brochures for homes available somewhere out of harm’s way. The shores of NewJersey can then return to the greenlands and pristine shores that attracted humans in the first place and the former human residents can then live relatively secure that no tornado, earthquake, hurricane, flood or mosquito infestation will harm them again. There is no place that is free from Mother Nature. Hurricanes are not ‘common’ to the Northeast…certainly not one that was perfectly time to coincide with the Full Moon, High Tides, etc. Once again it was the government that caused this mess. When flood insurance becomes too high because the private companies have to pay out too many claims, the government steps in to provide insurance. So we end up with people living in places they can’t afford. Also, I think it was Mark Steyn, who pointed out that one of the reasons the damage was so terrible, is that all power and communication lines are above ground and therefore both entities are instantly subject to shutdown in acts of nature like this. He points out that governments should have bitten the bullet and put the lines underground. Think about your own communities: where are the power and communication lines? I would have much rather seen him call the Democrats on putting pork in the bill that made it unpassable for the Republicans. That would have been calling out the real issue. Instead he chose Easy St. I won’t vote for him now. Exactly. No blame for the pork. I agree that it is unseemly for Christie to demand money from the federal government. However, I’m not sure that I agree that the federal government should ride to the rescue. Here’s why: My own hometown is in hurricane alley and was recently hit by tornadoes on Christmas day (that badly damaged my old high school). I remember Hurricane Frederic hammering us. It was in the early days of FEMA and neighbors mostly banded together to repair damage and fix debris. FEMA only handled those elements that were too large for people to fix on their own (the Dauphin Island bridge, for instance). As FEMA has grown and take on a larger and larger recovery role in subsequent storms, people have started to wait for someone else to show up and do the work. The result has been many people affected by the Christmas day storm are sitting around waiting for asistance rather than taking action on their own. That is not a good thing. I agree with you William. Good points that you make. My heart goes out to those who were affected by Hurricane Sandy, but doubt much of that $60 billion will get to those who are truly in need. Most will go to the administrators (Christie cronies) in the phony redistribution programs. Like all big government RINOs, Christie likes to bring home the bacon to his constituents. Don’t blame Christie, that is the nature of the overweight beast. I blame the politicians – from both sides of the aisles – who refuse to open their eyes and look outside the bubble of bustling streets and booming businesses in Washington, D.C. – the largest wealth redistribution center in history. Out here in flyover country we’re screaming at the top of our lungs – STOP SPENDING!!! WE’RE BROKE!!! When are these frauds going to stop trying to make themselves look noble by handing out our hard earned money like candy. It’s time to cut up the credit cards, get a debt consolidation loan, and live within our means. The American people are making these hard choices in their personal lives – it’s about time the adolescents in D.C. grow up and do the same. Excellent Keith. Excellent excellent analysis. Christie is showing himself to be as worthless as a democrat, and even more corrupt with his conservative pretensions. Thanks Keith, and just keep chipping away with the truth at your back. God bless you. Is that what it was? I thought we had another earthquake. Christie is done as a valid Republican candidate. re-APPOINTED…….by the thugs that controlled the voting machines. I was always surprised people thought Christie a viable candidate for national office. Outside of the Northeast, his schtick gets old real fast. People in the South, Midwest, Rocky Mountains and West would never vote for the guy given a viable alternative like Rubio, Ryan or Jindal. Maybe he can rally the morbidly obese voting block, which is quite large, but I doubt it. His love afair with Obama and his dissing of House Republicans is political theater to get reelected in a heavily blue state. Even before Sandy he was never a viable national candidate. After helping Obama win relection he is toast and might as well switch parties. As far as I am concerned, he is dead to me as a Republican. I am SO over this guy. I like to think he doesn’t have a chance as a national republican candidate, burg I couldn’t imagine Obama getting reelected, so never say never. I despise that pig. He’s a muslim knob slurping regressive commiecrat traitor. If were lucky he will stroke out. Christie thinks he has a shot at 2016. My personal feeling is that Christie never thought he had a shot in 2016 which is why he has commited political suicide with the Republican party. It all about being reelected Gov. Thanks for the laugh with the caption Keith…I can just picture him actually saying that. So if bailing out Sandy “victims” will cost me $240, I’m glad I didn’t donate to the Red Cross but to the Humane Society. Great analysis Keith! It seems the predictions of long gone conservatives are coming true, the ” Gimmee Culture” has become so pervasive that even people who once would have opposed it in all its forms now have been corrupted by seeing so much given away they’ve decided it’s principled and only fair and reasonable to surrender all opposition and join in the fray to fight for their own share of the slops! Gov. Chris Crisco “Fat in the Can” is just another unprincipled fair-weather whore and no one should be suprised at how he’s conducted himself, unfortunately.